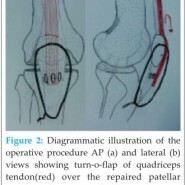 Successful Surgical Management of Neglected Patella Tendon Rupture. Department of Orthopaedics, Mahavir Hospital, Indore. India. 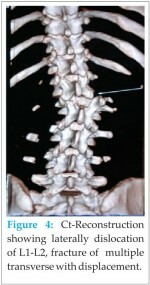 Department of Orthopaedics, UCMS and GTB hospital, Delhi. Introduction: Although patellar tendon injuries are common but chronic patellar tendon rupture are rare injuries but severely disabling. Problems associated with this injury are scar formation, atrophy and contracture of the quadriceps, poor quality of remaining reabsorbed tendon, inadequate soft tissue, proximal patellar migration and prolonged post operative immobilization. Hence these injuries are technically difficult to repair with invariably poor functional outcome. We report such a case of neglected patellar tendon injury in a leprotic patient successfully treated with trans-osseous encirclage wire and turn-o-flap. Case Report: 61 years old leprotic male presented after 10 months of trauma due to dog bite with decreased range of movement arc of left knee joint and inability to run. On examination, below the healed scar at knee, a palpable gap was present. X rays showed patella alta with loss of soft tissue continuity of patellar tendon and decreased insall salvati index. 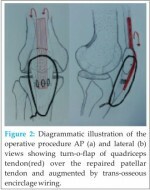 The neglected patellar tendon injury was repaired with end to end approximation and doubly augmenting it firstly with transosseous wire between patella and tibial tuberosity and further augmented by turn o flap of quadriceps over the repair, having excellent results after 2 years of follow up. Conclusion: Delayed and chronic repairs are challenging to treat and rehabilitate. Accurate early diagnosis of complete patellar tendon rupture allows for an easier and stronger repair, giving the best clinical results. End to end repair with double augmentation of repaired stump by transosseous S-S wire reinforcement and further, turn-O-flap of quadriceps in single stage, to increase the strength of repair, allow earlier mobilization and preventing secondary re rupture giving excellent results. Keywords: Neglected patellar tendon injury, Transosseous wiring, Turn-o-flap.